Now don’t be calling your bookie because we don’t do numbers quite that way in Numerology. However, on a quick note of how the truth can be spelled out from the name via Lexigrams, it is our wager to forecast that Baltimore will not be the victor at the end of Super Bowl XLVII this Sunday in New Orleans. Remember, New Orleans is quite the city of karma. Take a look at the mystical evidence behind 2010’s Super Bowl when their hometown team was destined to be crowned the winner over the Colts, hands down. Check out A Karmic Super Bowl archive and determine for yourself. We equally encourage you to engage in Chapter Eight of ‘It’s All in the Name,’ wherein this chapter devoted to Sports will astound you in it’s revelations about how the names and titles -from players to teams- will ever fascinate you with the truth to be told from the very letters that compose them. 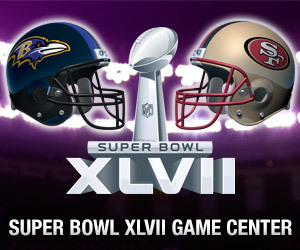 So, why will -all football statistics aside- San Francisco have the advantage over Baltimore on 03 February? It’s all in the name…. We even decided to ponder the very title of ‘Super Bowl Forty Seven.’ In keeping in mind how Lexigrams are much like poetry or prose, a mind must bend a wee bit to take in the phrases that reveal in their more short statements, about how Sunday’s game will unravel. Happy Super Bowl Weekend America! As one can read in Chapter 2 of the rules of Lexigrams, they are NEVER meant to predict the future in such a way that one is seeing if harm may ever come to another. While predicting the outcome of a sports events may not be cast into that kind of category, prediction is a “tough word.” It leaves no room for free will to live. And it was quite apparent, the free-will of the BALTIMORE RAVENS decided upon the other option within their name, that which also states: SO SET TO BEAT A NINERS RIVAL IN NE(W) ORLEANS. So, too is it with you. You always have a choice. I’d say the phrase from the 49ers: SET TO SOAR IN A “FATE CITY” still held true for this game, they made quite the comeback after the lights out bit. Who would have thought to Lexigram that phrase from SUPER BOWL FORTY SEVEN? FOR A RUN, WE SEE NO POWER, FOR YES POWER BLOW OUT. Guess we should have spiraled on POWERLESS more. Congratulations Ravens. That was some pure potential you pulled out. For typically when NO or NOT is spelled in a name, it means what it says. But this is why rules, can always be broken. Again, free will wins. And apparently so did Spirit this evening in NoLa too. But still, it was also all in the name. ARE YOU PLANNING FOR SUCCESS in 2019? Timing IS Everything! Learn What's Really In A Name! » What Are You Feeling? Copyright © 2019 by Sharita's Star Secrets. All rights reserved.